Everyone wants to be a superhero. As a kid, you probably put on a sheet or towel and pretended to soar through the air. What began as a silly prompt, Pickles is the tale of Annie and her super boyfriend. It's cute idea but the execution and material did not live up to the super hype. Written and directed and starring Laura Minadeo and Alexander Rotella, Pickles was like the titular dog, missing. The premise of the play is Annie, a cosmetology grad, gets in a bit of trouble and is rescued by Everyman, the city super hero. When Annie wakes the next morning at his apartment, she discovers that she now knows more about him than she should and uses the information as blackmail. When the city is overrun by zombies, or people who lack caffeine, it's up to Annie and Everyman to save the day a defeat the Decafinator. The prospect was promising but for a comedy, it sadly was unfunny. Staging issues aside, without the aid of an outside director, there was no guidance or fresh opinion on the material. What may be funny to a writer may not be to an audience and with Minadeo and Rotella taking on the dominant roles it was doomed. As far as structure goes, the set up was inconsistent. It began with Annie serving as a live narrator for her story. It then moved into voice over. And then nothing. Deciding which of the three is strongest will allow the through line of the play to stand coherent. As Annie and Everyman, Minadeo and Rotella balanced each other out. Rotella was very reserved while Minadeo was boisterous. In fact, Minadeo had major modulation problems, finding herself yelling her way through the show. The strongest player by far was Erin Archer as The Decafinator. She brought so much energy and excitement. Despite the ridiculous character, Archer had such conviction. The staging of the play was pretty basic. Utilizing the spinning wall units allowed various locations to be realized. The heroic score added a nice layer to the world of the play. Every superhero needs their opus. 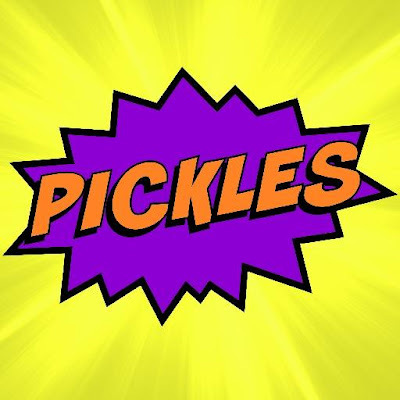 Pickles greatly needs the creators to pick a single role and stick to it. Wearing too many hats at once greatly altered the piece. Strong theater relies on strong collaboration. A strong collaboration may mean another opinion.